The beans are indi­vid­u­al­ly picked as they ripen. We are at the peak of the har­vest sea­son, and dur­ing this time, we are har­vest­ing about a hun­dred beans out of the vanillery every two to three days. Choosing which beans to take requires some pret­ty sharp obser­va­tion: the col­or change can be hard to see in the shady tan­gle of vines. The beans were pol­li­nat­ed almost a year ago, and a lot of vine growth has tak­en place since then, bury­ing many of the brooms deep with­in the growth. In the dim light, it’s easy to mis­take the gen­tle light­en­ing that takes place as the bean matures for the clear sig­nal of true ripeness. Choosing the moment to har­vest any one bean is a bit of a game of brinks­man­ship. 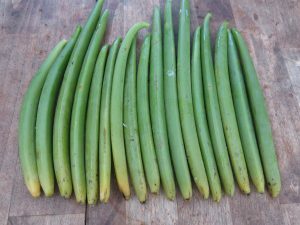 We want the bean to be at the absolute peak of ripeness, but if you miss it or wait too long, the bean begins to split open, prepar­ing to release it’s seeds. At that point, the vanil­la pod can­not be sold as a whole bean, although it is still good for mak­ing extract. We’re look­ing for a strong orange-yel­low col­or at the tip of the bean, along with a hint of the split begin­ning to form. 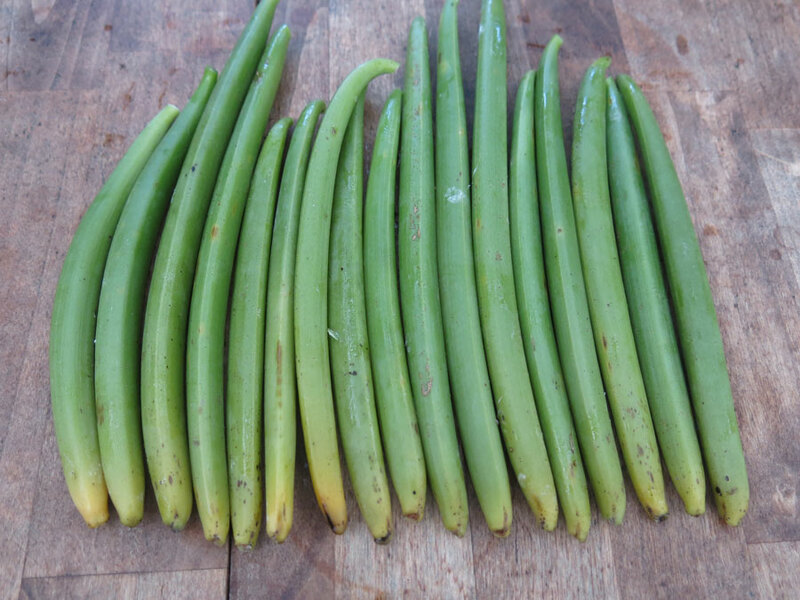 A pas­sel of ripe beans, these will become Grade A beans when cured and aged. Oh, and watch out for the sap! Like many trop­i­cal plants, vanil­la employs a chem­i­cal defense against for­ag­ing ani­mals. This is due the pres­ence of cal­ci­um oxi­late crys­tals, which are small and sharp enough to get into the pores of your skin, caus­ing minor but some­times pret­ty painful irri­ta­tion. During har­vest, we’re care­ful not to touch the sap or get it on the skin. 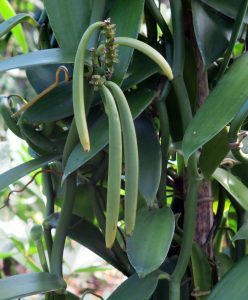 When han­dling fresh­ly-har­vest­ed pods, latex gloves are used, as the sap is hard to avoid once the pods get into the har­vest box.